I absolutely love old bottles. I have since I was a kid – there are a lot of them around the house, sitting on shelves and generally just being rad. There have been so many in the house that at times I have to list them for sale in the Etsy shop just to try and free up some shelf space. Which would make sense, in a good old de-cluttering kind of way, except that my husband and his coworkers are enablers. Their job involves digging, and guess what folks did back in the day? They buried their garbage. Every so often my husband comes home with an armload (yes, armload) of old bottles they dug up on a job. I swear, for every 1 that goes out, 2 come in. I’m pretending to be annoyed about this, but seriously, it’s wonderful. My inner hoarder is pleased. Almost every time, the bottles are…gunky, for lack of a better word. I’ve cleaned my weight in bottles at this point, so I thought I’d share my cleaning tips. 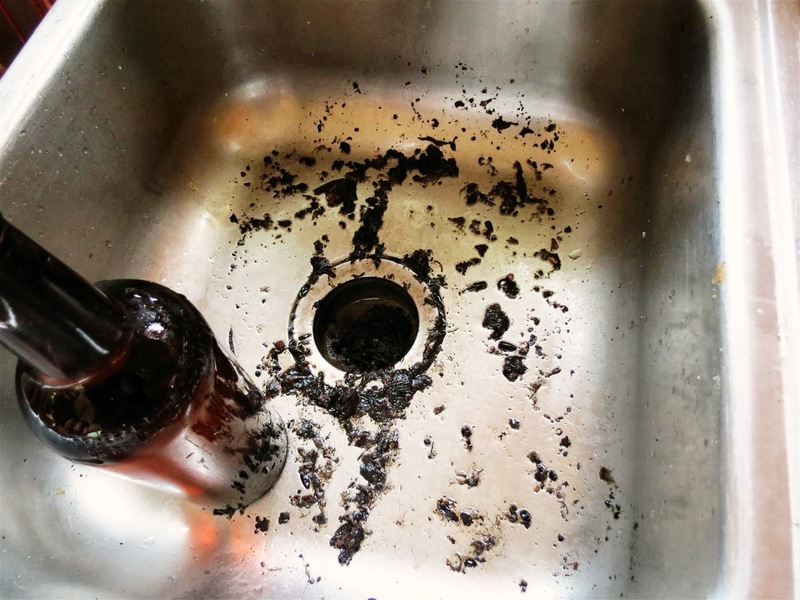 The first step to de-gunking is to fill the bottles with hot water and try to shake loose as much as possible. Then, fill them again and let them sit in the sink as you’re working. The above bottle had some green…stuff…in it that wouldn’t shake loose. 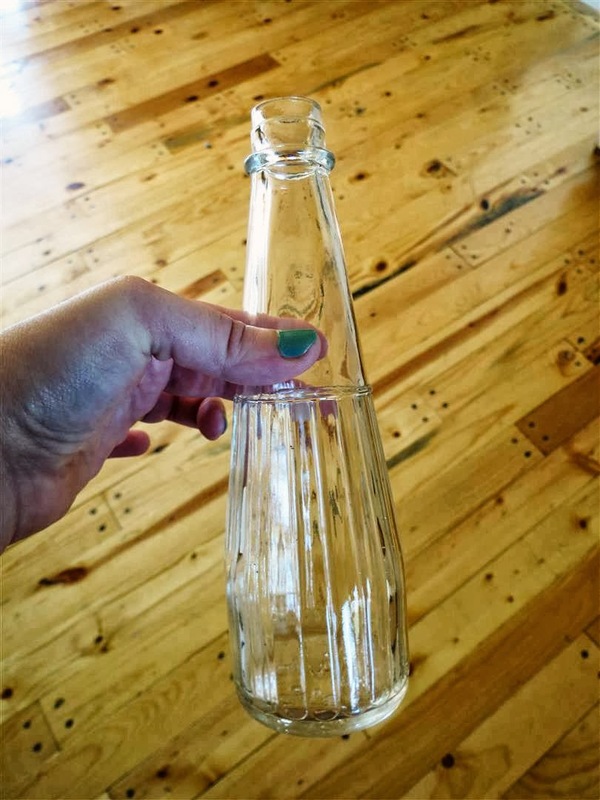 Here is my Genius Method For Getting the Stubborn Gunk Out of Old Bottles. I use cotton rounds, but cotton balls would work too. 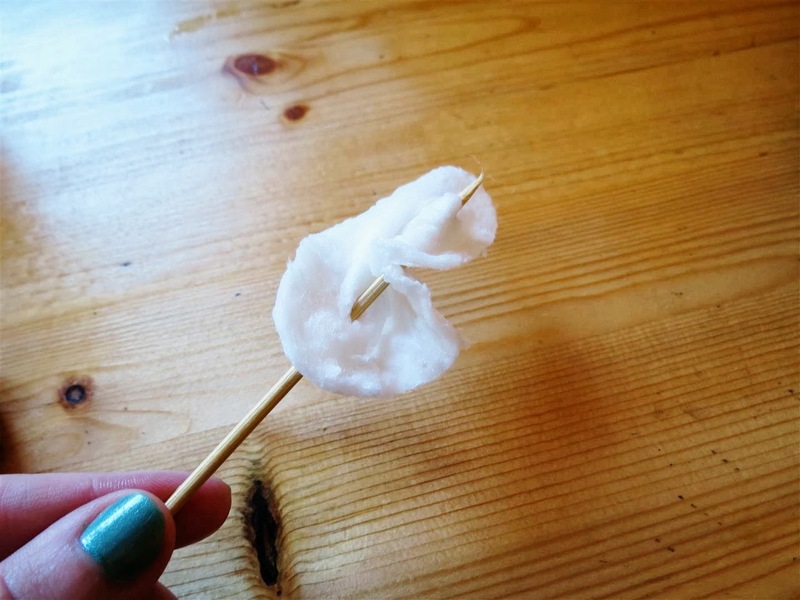 Then you need something bendy – a small wooden skewer works well. 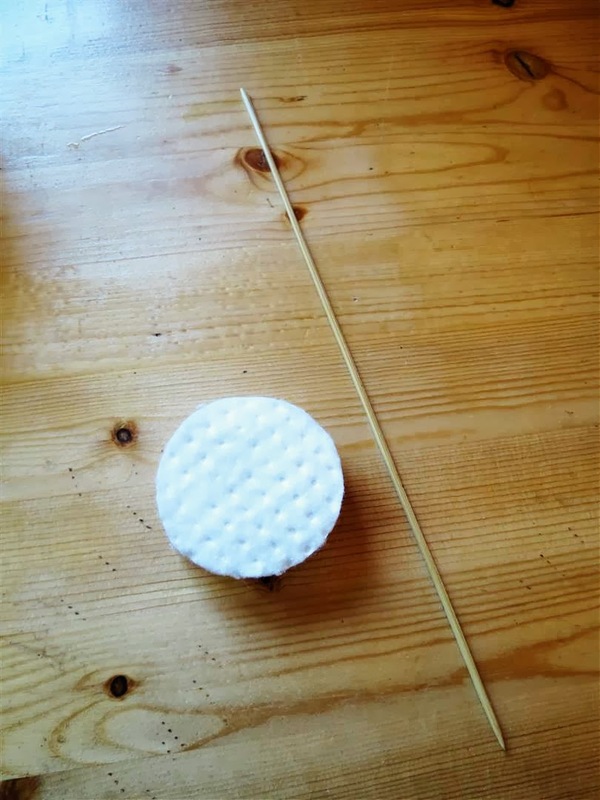 Get the round wet and thread the skewer through it. And then shove ‘er into the bottle. The skewer is pliable, so you can bend it in any direction to really get that cotton round all over the bottle. 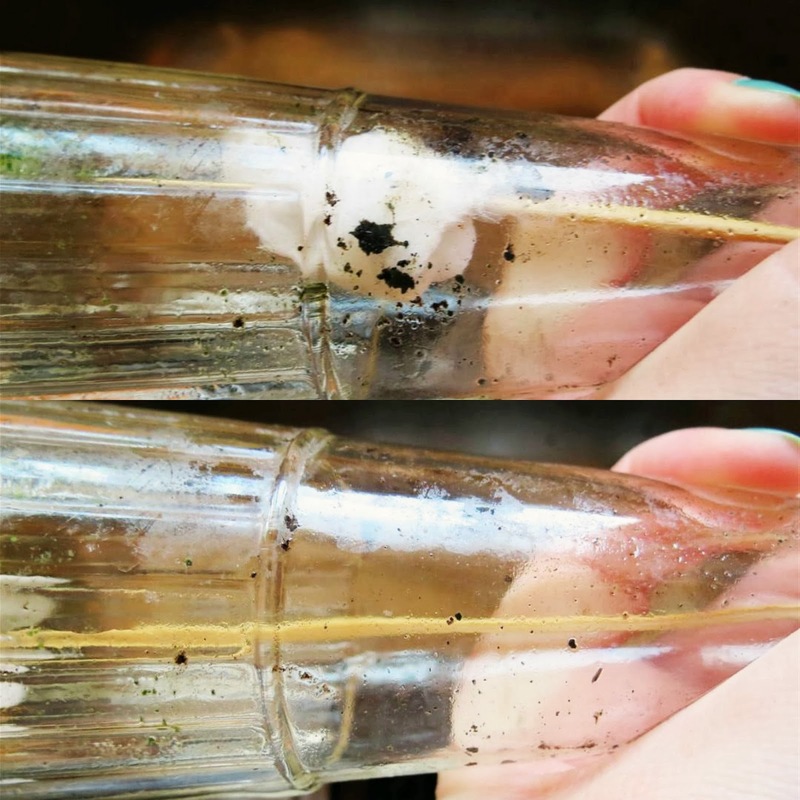 Once the worst of the gunk is out, pull the skewer back out (if the cotton round falls off inside the bottle, fetch it with a pair of pliers. Or forceps. Which are more fun.) Give the bottle a good wash with hot soapy water and you are done, my friend. Some of you are probably thinking, ‘It’s called a bottle brush, moron,’ and you would be making a lot of sense. However, most are too large for what I’m usually cleaning. This method cleans everything from large bottles to tiny apothecary bottles with necks too narrow for most bottle brushes. 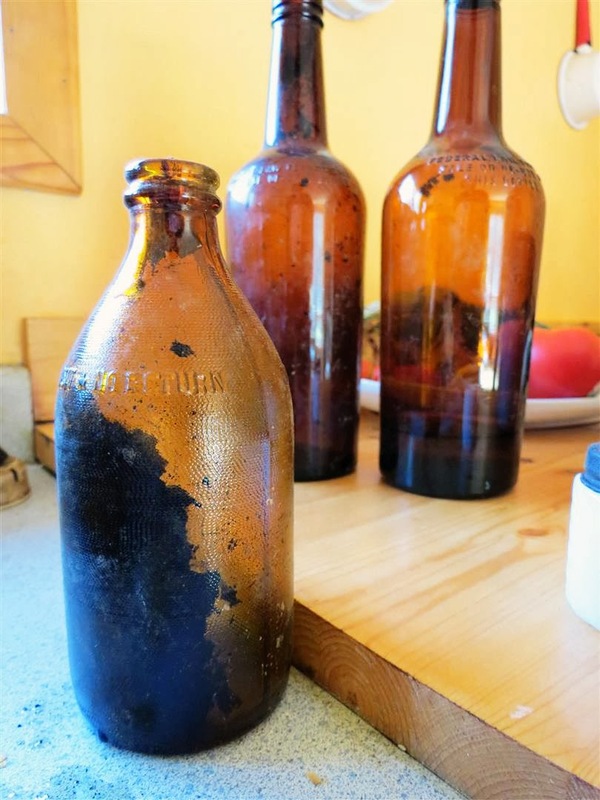 A note on cleaning old bottles, especially those found in the woods and/or buried – they can be filled with all sorts of lovely things. This small bottle? Had all this in it. The drain was almost completely filled, and there were shards of glass in there as well. So be careful! But it’s worth the effort. Look how pretty they are. All of these bottles were cleaned up and listed in the Etsy shop. But if they don’t sell, I may just have to make the sacrifice and keep one. Or two. Or twelve.